On your way out of the restaurant you grab a few toothpicks and start cleaning your teeth. You’ve done this a thousand times before and haven’t thought anything of it until you feel a zing in your tooth. That’s strange, you wonder if toothpicks could be harmful to your teeth? Your dentist in Tulsa explains. 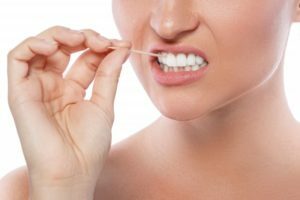 It may seem efficient and more convenient to grab a toothpick and clean between your teeth after a meal, rather than waiting to floss your teeth later on. However, that toothpick may be doing more harm than good, especially when you use it vigorously. Whether they are made of wood or plastic, toothpicks can cause damage to your delicate gum tissue. They also aren’t capable of reaching between your teeth the way that dental floss does. If you regularly find yourself getting food trapped between your teeth and reaching for a toothpick, this could be indicating deeper problems. Teeth that are crooked or overlap often become food traps and can be hard to keep clean. You could also be suffering from tooth decay. A softer spot in your enamel or a hole can trap food and cause discomfort between your teeth. An examination with your dentist is a good idea to determine if something like decay is the source of your food trap. You’ll want to remove the decay and strengthen your tooth with a filling before it’s allowed to progress further and cause more damage. Start with at least 18 inches of floss wrapped around your middle fingers on each hand. Gently move the floss up and down between your teeth hugging the sides in a c-shape. Repeat this motion on both sides your tooth. Use a clean area of floss for each tooth and be careful not to floss too vigorously. If you still find yourself grabbing toothpicks after meals, contact your family dentist in Tulsa to arrange an examination. Getting to the root of the problem can help you eliminate the need for a toothpick. For over a decade, Dr. Angie Nauman has been serving patients in Tulsa, OK. She believes that a visit to Glisten Dental should fun, welcoming, and comfortable for her patients, so she and her team strive to make every visit exceptional. Dr. Nauman is a diplomate of the American Sleep and Breathing Association, so patients will find advanced services at Glisten Dental such as sleep apnea therapy that they may not find at other practices. If you would like to contact Dr. Nauman, she can be reached by calling 918-254-8686 or through her website.